Well today I am making Pork in Pipian sauce, for those who don't know what it is click on the link PIPIAN . I am also doing my crochet and watching some nice TV on the Sci-Fi Channel. So here is a potholder of my own design. I got inspired this Fourth of July to make a nifty pot holder. Three flowers with leaves . The back as you will see below has a raised edged that is to help the potholder be proped from the wall where it will hang, giving the it a raised surface look on the back. At this time I guess I am experimenting with potholders. I get a lot of ideas from regular crochet stitches. I also get ideas from granny squares and Octagons and simple non square designs. I have made this potholders with left over yarn making it economical and practical. I guess it becomes me, being a Taurus, it is just natural. There is a red Flower that it is suppose to mimic an anemonae, the yellow daisy and an african violet. I did the center with a blend of black alpaca yarn that is a left over from a long time. Finally I found something to use this las vestige of black left. Thanks for stopping by and come back again as I will continue to make my 12" INCH Granny Squares and my Pot Holders and Dishcloths. 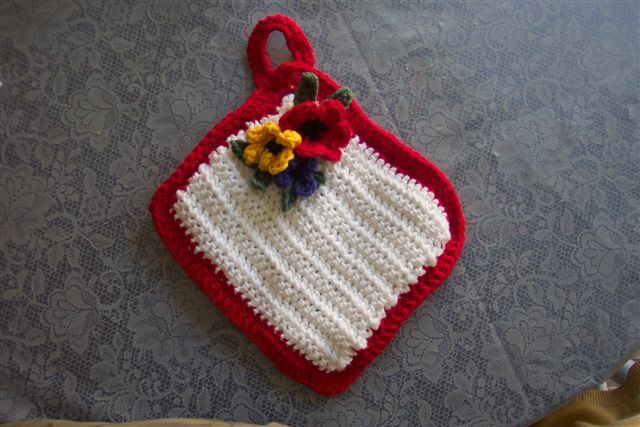 We do have a potholder and dishcloths exchange every month at http://groups.msn.com/crochetdepot . August will be Dishcloth exchange. Come and join in the fun. Until later. That's one terrific potholder you have there, Andy. Very, very, pretty.